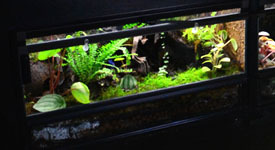 What's better than an awesome live vivarium? How about one with one of a kind supporting hardware! 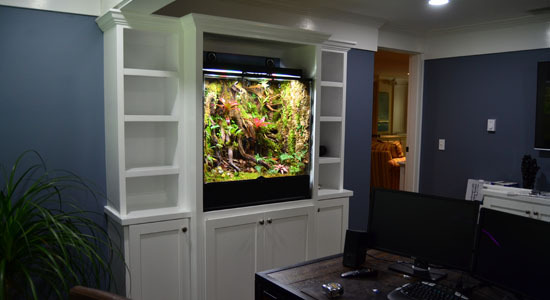 Our team has created a bunch of different custom parts over the years, and we're happy to tackle projects big & small, commercial & residential. 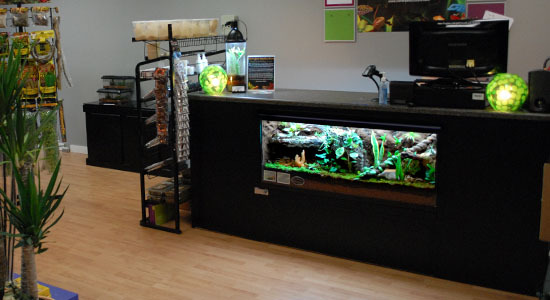 Whether it's a simple custom hood with forced ventilation, or a 7 foot tall fully enclosed vivarium rack system, our team of vivarium specialists is up to the task. For increasingly difficult projects, or those which require local permits to create, we're glad to work with a contractor of your choice to bring the work to life. 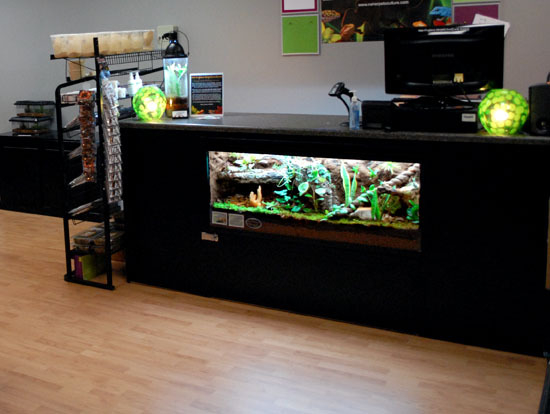 Up until the beginning of 2017, the majority of custom parts we created were to support some of our in-house Custom Vivarium Commissions for clients & our own locations. This service is a difficult one to describe, since it can vary so wildly from one project to the next. The bottom line is, if you can imagine it, we'd love to help you bring it into reality. Our work focuses on elements including glass, aluminum, T304 stainless steel, light electrical work, and other technology-oriented development. A recent favorite project of ours included a client who desired to have a completely "hands off", realistic jungle in his office. 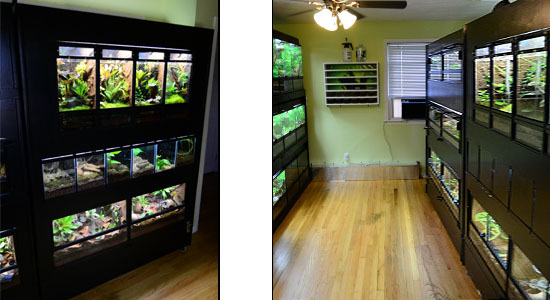 (Shown above right) Beyond an epic living vivarium environment, he also requested us to create an automated storm cycle, complete with clouds/fog, rain, thunder, lightning, and a full soundtrack of the location-specific jungle storm environment. 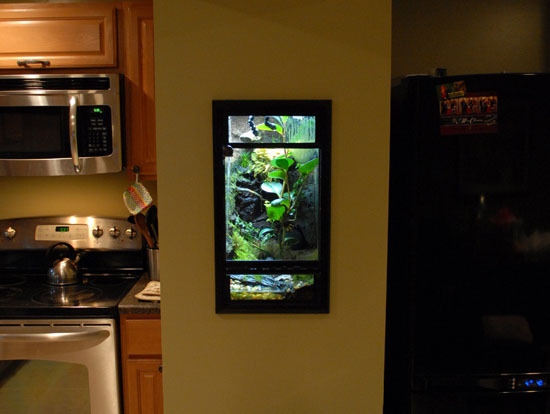 It was a serious undertaking, but we're excited to say the outcome was fantastic, and the client was thrilled. 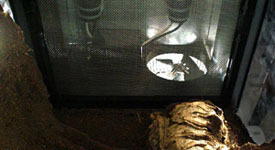 The project required a unique schedule of timed events, half-a-dozen one of a kind parts, modified lighting fixtures, a custom soundtrack, and more to bring it into reality. 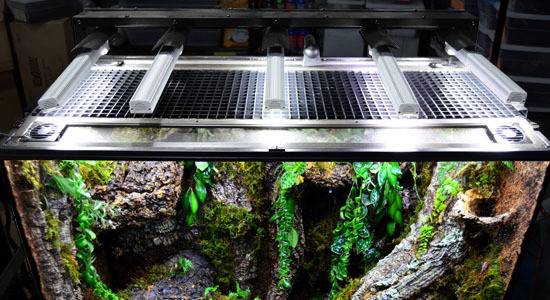 It's a great example of what a bunch of custom parts can do, towards bringing an awesome vivarium to a whole new level. Smaller custom parts can be shipped fairly easily, and we're happy to do so whenever it would be convenient. We're hesitant to ship some fragile glass materials, but we handle that decision on a case-by-case basis. 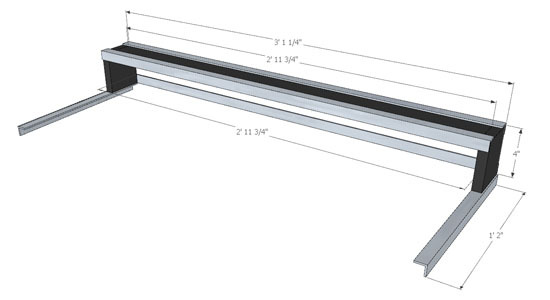 For larger or more delicate projects, we can only directly service clients who are able to pick up at our warehouse in central Connecticut. Shipping via LTL Freight can sometimes work, but there is a significant added cost in doing so. If you are looking to have a large product commissioned but are outside of our service area, we still might be able to help. Rather than having us act as the builder, we can act as a consultant, and work with a local contractor of your choice. 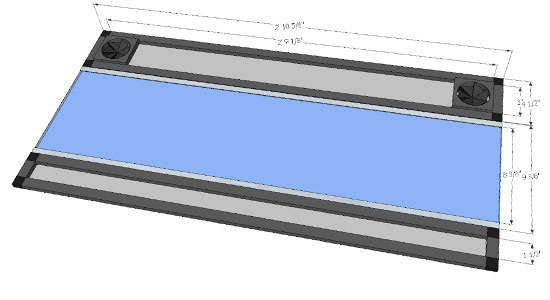 Providing 3D blueprints for whatever part you've got in your head is no problem at all, and depending on the costs of the contractor you select, it might not be much more expensive overall. 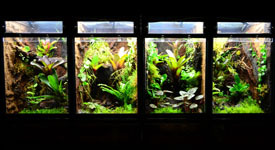 Lastly, while we're happy to design useful vivarium supporting products, we aren't a custom glass terrarium manufacturer at this time. 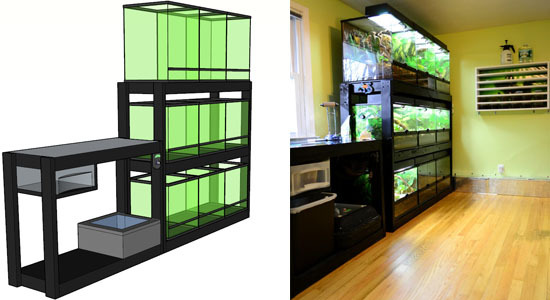 Our focus is the design & creation of vivarium supporting products, not building glass enclosures themselves. There is no obligation to purchase by submitting a request. We'll email you with any questions we may have about the job before we begin working on a quote. All quotes are free, with the exception of jobs which would require excessive amounts of effort to put together. (If that's the case, we'll mention it before starting!) Fill out form. 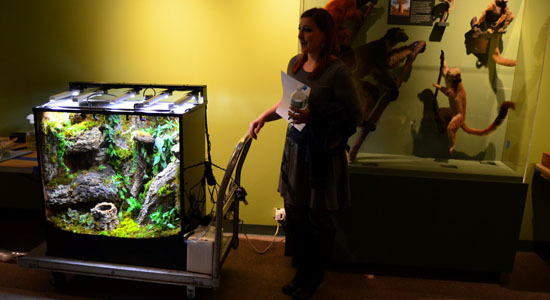 Animation displaying the construction & sliding nature of the in-desk vivarium. 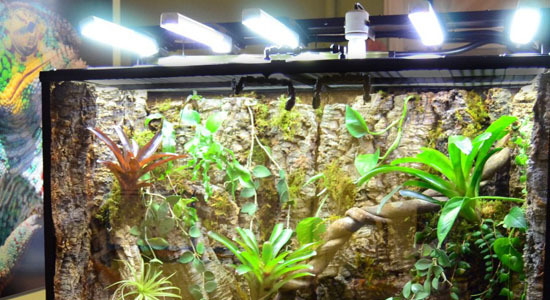 The sliding mechanism holding the 55 gallon vivarium was built to hold 500lbs, and the unit concealed lighting, forced ventilation, and automated misters. 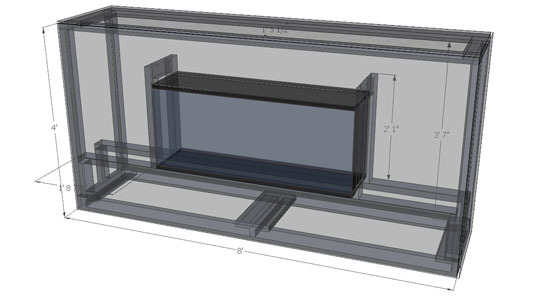 Animation displaying the design & supporting structure of a wall mounted vivarium. 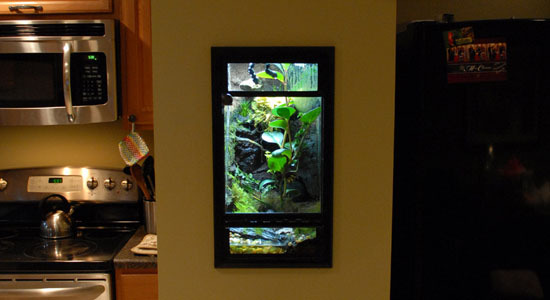 Custom parts included the all-glass vertical conversion kit, a modified aquarium with hidden forced ventilation, and the support structure for the vivarium itself. 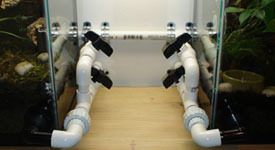 An incredibly simple, inexpensive, utility rack holding 9 Exo Terra vivariums, an incubator, and a drawer for storage. 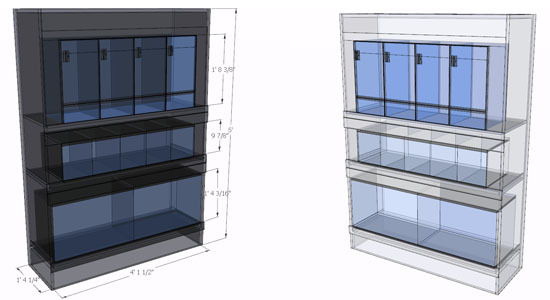 Racks like these can be designed and built in just a few hours. 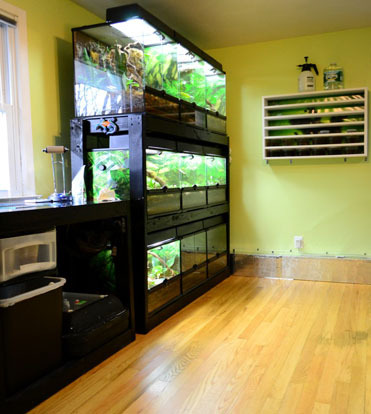 They aren't necessarily pretty, but a great solution for breeders or enthusiasts on a budget.